See what happens when Man vs. Food host Adam Richman meets Chicago’s Meaty Legend! 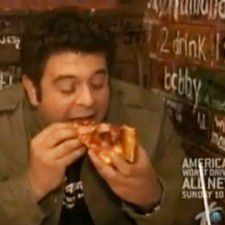 Food enthusiast Adam Richman, of Travel channel’s Man VS Food, takes on Gino’s East’s Meaty Legend deep dish pizza. Can Gino’s 3 inch thick Chicago-style pizza turn a kid who was raised on Brooklyn thin crust into a deep dish die hard?